Throne speech aims to increase literacy through private sector partnerships, reduce number of children in care. 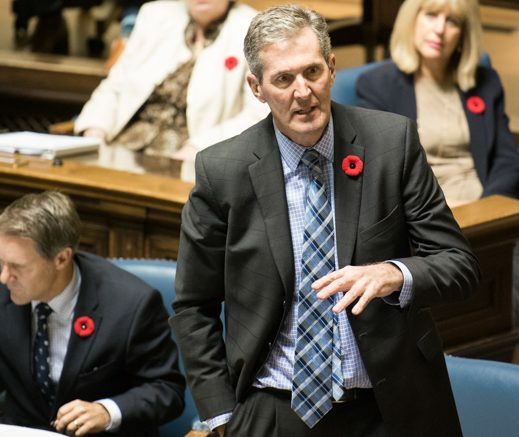 Brian Pallister speaks in the Manitoba Legislative Assembly. The government’s speech from the throne opening the third session of the 41st legislative session on Nov. 21 outlined the priorities of the government and indicated an overhaul in the delivery of public services. Manitoba’s Progressive Conservative government plans to reduce public sector spending by cutting senior management in the civil services as a part of a “new public service transformation strategy,” to focus on new early learning strategy to invest in child-care spaces, and to reduce the number children in government care programs. “A new public service transformation strategy will challenge public servants to better understand and meet the needs of citizens, question past practices and experiment with innovative ideas, and harness their collective talent,” reads the speech from the throne. This is in addition to the eight per cent cut in provincial civil service jobs over three years previously announced by the provincial government. Kevin Rebeck, president of the Manitoba Federation of Labour, said he is disappointed with the speech. “That to me means more cuts are coming to the public service and that’s not what Manitobans want and that’s not what this government got elected on,” he said. “They can keep trying to make that claim. But they got elected on a promise to protect and improve public services and they are not living up to it,” he added. Rebeck said the provincial government seems “determined to double down on cuts” and the throne speech is an indication that the provincial government is not listening to Manitobans. The throne speech also mentioned the government’s intention to review services provided by both municipalities and the provincial government to reduce overlap and streamline delivery of services, including road maintenance, snow clearing, and water control and drainage. Winnipeg mayor Brian Bowman said the provincial government does not have the priorities of Winnipeggers in mind and argued the streamlining of services will put an undue burden on the two-thirds of the provincial population living in Winnipeg. The government recently ended a 50-50 transit funding deal with municipalities, leaving a $10 million deficit on Winnipeg Transit’s 2018 budget. This resulted in a city budget proposal that includes the reduction of service to 23 transit routes, a 25 cent hike in bus fares, and job cuts. “We also did not hear specific reference to transit operational funding, which, as you know, was recently cut by the province of Manitoba,” said Bowman. He added that there was also no reference to any long-term municipal funding policy. Manitoba NDP leader Wab Kinew said the speech indicates further cuts to public services. The provincial government vowed to introduce new legislation to allocate additional resources, programming, and private partnership to improve literacy and numeracy skills among young children across Manitoba and to create new child-care spaces. According to a Program for International Student Assessment report – conducted by the member countries of Organization for Economic Co-operation and Development – Manitoba ranks second to last in science and reading and third last in mathematics, when compared to other provinces in Canada. The exam showed that students in Manitoba are approximately a year behind in reading and science and more than half-year behind in mathematics compared to Ontario, Alberta, and British Columbia. “Our work will continue to improve outcomes in early years literacy and numeracy by refocusing resources and enhancing the programming during this critical period of development,” the speech reads. Norm Gould, president of the Manitoba Teachers’ Society (MTS), said it is concerning the teachers were not consulted before a partnership with private enterprise was announced. “I would think that educators, certainly kindergarten teachers [and] Grades 1, 2, and 3 [teachers], would be able to bring something to the table and talk about the needs that are necessary for students when they enter school,” Gould said. “Moving children from government care to guardianship with adult caregivers has been shown to provide stable, healthy, and lasting relationships that greatly improve the long term social, emotional, and physical health of children and youth,” reads the throne speech. Kinew said the high number of children in care is a “major issue” and that “no government has done enough” to address. “When they talk about making the move from foster care to legal guardianship, they missed the first call to action of the Truth and Reconciliation Commission’s (TRC) final report,” Kinew said. The commission, which investigated Canada’s residential school legacy, issued a report with 94 calls to action to move toward reconciliation between Indigenous and non-Indigenous Canadians in 2015. Recommendation one calls on “the federal, provincial, territorial, and Aboriginal governments to commit to reducing the number of Aboriginal children in care,” with a focus on keeping Aboriginal families together. In an attempt to transition Indigenous children from mandatory residential school education into the public school education in 1950s and 1960s, thousands of Indigenous children were taken from their homes and communities by child-welfare service workers and placed with non-Indigenous adoptive families or institutionalised foster care. Minister of Justice and Attorney General of Manitoba Heather Stefanson, speaking to reporters, said the government wants to move kids out of government care programs and into guardianship settings.